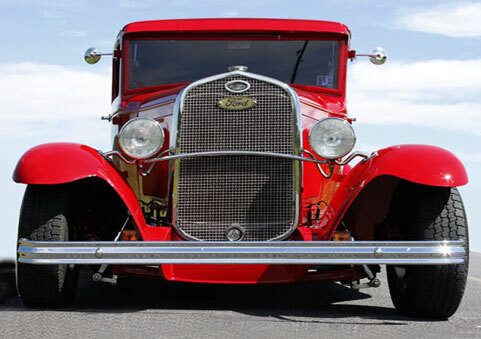 It’s a Model A Ford—OH MY LORD! wrapped in red, bright as can be! and fusses over every detail. He shows it all around at car shows and has won dozens of awards. But you know, just sittin’ up behind that fold-up windshield, runnin down the road with that much power underfoot is a trip. Brings me back to my high school years in the famous days of American Graffiti. Days when only cars and girls mattered (sometimes not even cars). 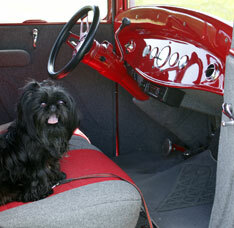 Wonderful days when the music and the times were achanging but everyone appreciated a classic car. 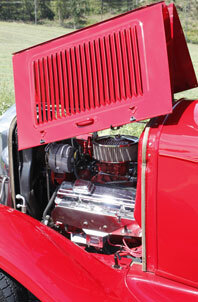 This roadster is so red hot you are almost afraid to touch it! Norman took me for a ride around Ickesburg. His neighbors saw us and waved right away— “Here comes Norman and his bright red beauty!” WHAT A FINE SIGHT TO SEE! Even Miss Minna loves the it! 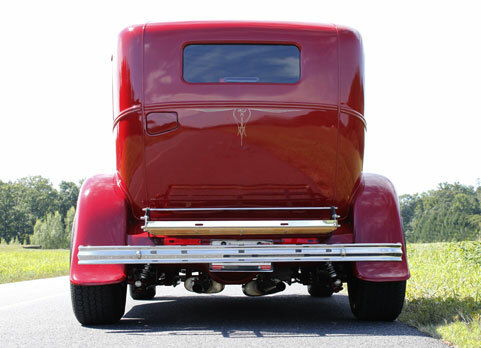 The shape of a coach, precision pinstriping, loving detailing. 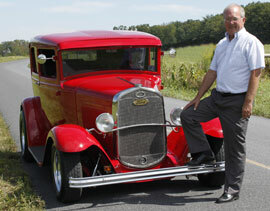 Introducing Norman Maxton's hot red 1931 Ford . What a classy ride. Like your song too (except now I’ve got the tune stuck in my brain…but’s a good one.) Keep on riding and writing, Bill. Norm is a personal friend of mine and a super guy. It’s great to find him and his beautiful car “on the web.” These pictures are awesome. Thank you! You always, “Take it to the limit” because you’re living, “Life in the Fast Lane” like the “Desperado” that you are. That’s too much…I always overdo…I’m so glad you’re having so much joy on the road and still sharing it in your own inimitable style. What a cool car! It’s obvious this man has put a lot of time and energy into it. There are all kinds of passion.